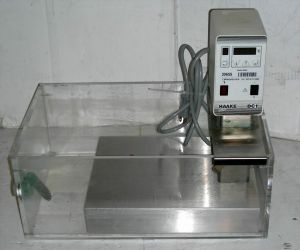 Product Description The Haake DC-1 immersion circulator is used for temperature control in open baths. It can be fixed to the wall of any bath (with a wall thickness of up to 25mm) using the standard clamping bracket included with the circulator. The powerful pump and swivel-mounted pump nozzle ensure optimum liquid circulation, and therefore, temperature uniformity thoughout the bath. Operating temperature range: 20 to 100C with tap water cooling. 17L/min circulation capacity. NOT recommended for use in sous vide cooking, since it's used and although we sanitize as part of our overhaul, we cannot guarantee sterility suitable for human consumption.